BRUSSELS, Belgium -- The European Union’s second-highest court struck down an asset freeze on two former Ukraine prime ministers and three other people tied to ex-President Viktor Yanukovych, but four of the five people will stay on the bloc’s sanctions list for now. 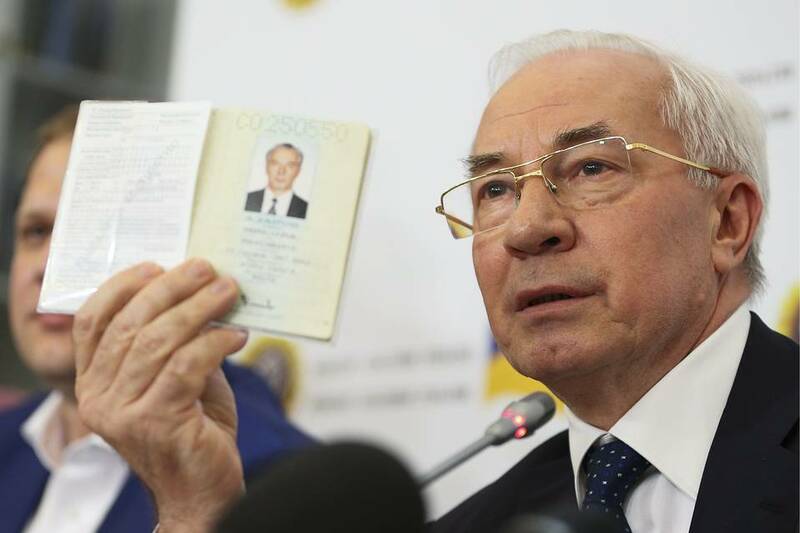 Ukraine's former prime minister Mykola Azarov in Moscow, Russia, in August 2015. The court accepted appeals against the EU asset freeze by former prime ministers Mykola Azarov and Serhiy Arbuzov as well as Arbuzov’s son, Oleksiy. Serhiy Klyuyev, the brother of a former top aide to Yanukovych and former energy minister Eduard Stavytsky also won their appeals against sanctions the EU adopted to stop the misappropriation of state funds. The decision was the latest blow to the sanctions the EU placed on Yanukovych’s inner circle in the chaotic days after the former president fled Ukraine amid a political crisis in the country. Days later, Russia moved to annex Crimea. The EU’s hope was to freeze stolen funds so that they could eventually be recovered and returned to Ukrainian coffers. The court has already struck down the asset freeze on another official the EU sanctioned. The bloc itself decided last March to drop the sanctions against several people because of the lack of hard evidence presented by Ukrainian authorities. Among those people was Oleksiy Arbuzov’s son. However at the time, the EU also relisted a number of the Ukrainians targeted on slightly different grounds. That means that Azarov, Arbuzov, Klyuyev and Stavytsky will remain on the EU’s sanctions list until at least March 6, when the asset freezes expire. The sanctions could be rolled over. Azarov, Arbuzov and Klyuyev have appealed the EU’s relisting of them but the EU’s General Court has yet to decide on those cases. A senior Ukrainian prosecutor said Thursday sanctions against 17 former Yanukovych-era officials remained in force, according to the news agency Interfax. According to the report, Serhiy Horbatyuk, the head of the special investigation department of the Prosecutor-General of Ukraine, said a representative of the prosecutor’s office would be sent to Europe to press for the continuation of sanctions. The EU also has just over two months to decide whether to appeal Thursday’s ruling to the bloc’s top court, the European Court of Justice. Maja Kocijancic, a spokeswoman for EU foreign affairs chief Federica Mogherini, said officials “are studying carefully the ruling” and will reflect on what action to take. EU officials have acknowledged they moved quickly against targets identified by Kiev for fear that stolen assets would be taken out of the country as Yanukovych’s government collapsed. For months, however, there was frustration in Brussels that Kiev hadn’t provided clear evidence against some of those targeted.